Why not try cooking “orzo”, an original type of pasta which looks like grains of rice. This tasty Le Cordon Bleu recipe, whose main ingredient is crab is served with confit tomatoes and sea vegetables which are packed full of minerals. Finishing cooking the pasta in the sauce is a technique which makes it is easier to ensure that the sauce completely coats the pasta and that the flavour has been fully absorbed. Bring a large pan of salted boiling water to a boil. Transfer the orzo pasta into the boiling water and par cook until it retains a firm bite. Refresh in cold water and reserve. Crab sauce: In a pan heat the olive oil and add the mirepoix, sweat until translucent, about 3 to 5 minutes. Add tomato paste and garlic and cook for a further 2 minutes. Deglaze with Cognac and reduce by 75%. Add white wine and bouquet garni and reduce by 75%. Add chicken stock reduce by half. Add the cream and strain through a china cap sieve. Add brown crab meat, taste and season. Allow to cool and refrigerate until required. Pre heat oven to 100°C. Peel tomatoes.Transfer the tomatoes into an oven proof dish and add the olive oil, garlic, thyme and salt. Mix together and bake until just soft, about 12 to 14 minutes. Keep warm until required. Transfer half the crab sauce into a large pan and add the pasta, heat through to finish cooking the pasta. Once cooked to al dente add white crab meat and warm through. Finally add the chopped parsley and chives and stir to combine. Re heat the remaining crab sauce, add cubed butter and aerate using a hand blender. Wash, dry and pick sea vegetables. 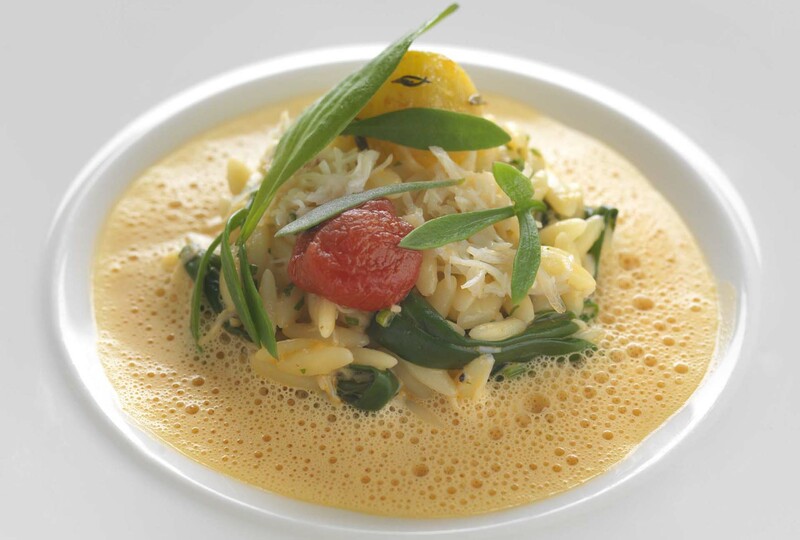 Spoon the crab and orzo pasta into the centre of a shallow bowl. Arrange the confit tomatoes on top. Spoon the aerated crab sauce around the pasta. Decorate with sea vegetables. This dish brings some foraging back into our lives. Collecting sea vegetables and even better crab fishing can be so much fun and rewarding too. To compliment the sweet meat of the crab, the softness of the tomato, the firm texture of the Orzo pasta and the fragrant and salty tang of the sea vegetables, why not go for a wine born near the sea. Vermentino which is grown in the Northern tip of Sardinia, on windswept rocky grounds just of the Costa Esmeralda is a perfect fit. The Cooperative Cantina Gallura top wine, Vermentino di Gallura Superiore Canayli 2014 has all of what is needed: a mouth-watering freshness to handle the texture of the crustacean and a lovely citrusy, floral perfume to mirror the aromas of the garnish. An alternative would be a dry Muscat or a New World Sauvignon Blanc.